- Size: Stand Height -13 inches with 8 inches openers and 3 inches glass diameter. 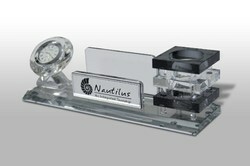 Office table set with an envelope opener, Bottle Opener & magnifying lens. We are engaged in manufacturing different types of Ethnic Table Tops. These table tops are elegantly designed by our designers. Having a touch of ethnicity the table tops offered by us are brought into application for various purposes. Table tops offered by us are available in different color, design and shapes. These are used for holding mobile, pens, cards and other things on the table. We are engaged in supplying desk top set with watch, that are characterized by their uncompromising quality and long lasting functionality. Available in various colors, designs and finishes, these are widely used in various offices, homes and other places. Our desk top sets are intricately designed and can act as a perfect item to enhance your desktop decor. Golden Desktop Gift, Size: 5" * 5 "
Size: 5" * 5 "
Beautiful comibination of Paper and Acrylic. With Acrylic Stand. We are offering Designer Table Tops. The range is widely acknowledged for quality contemporary finish, exuberant colour combination, colourfastness and everlasting shining. We are Leading Buying Agency in India of Gift and Accessories, Corporate Gifts, Promotional Gifts, Promotional Gifts, Desktop Gifts, Personalized Corporate Gifts Understanding client's specification & delivering in accordance is our forte and have been supporting us for our progressive growth over the years. 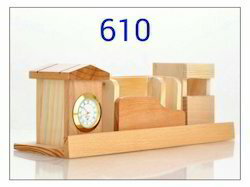 We understand the importance of time and thus, assure timely order delivery.